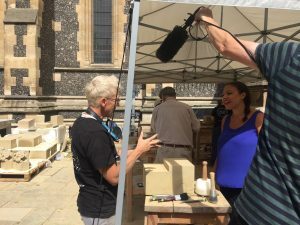 Collaboration with Southwark Cathedral featured on the BBC! 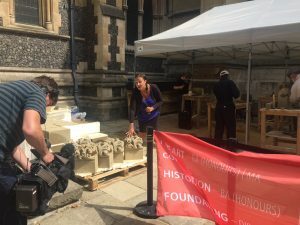 The Art School is thrilled to be featured on BBC London’s evening news today for our ongoing collaboration with Southwark Cathedral! The clip can be viewed on BBC iPlayer until 7 pm on Tuesday 15 August (view at minute 17:00). 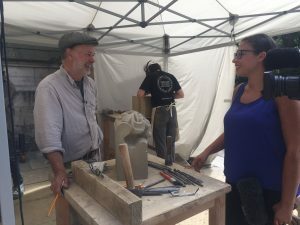 The project is a two-month commission by Southwark Cathedral through which students, staff and alumni from our Historic Carving Stone Carving course are carving 44 stiff leaf bosses. 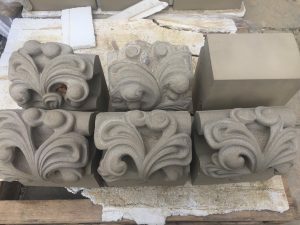 These sandstone pieces will replace those from 1820, which have eroded and suffered damage over the past two centuries and would have been carved with much the same techniques and tools that our carvers use today. The work is part of a £500,000 restoration project being undertaken by Southwark Cathedral, and we are delighted to be collaborating with such an important South London landmark. The carvers will be in the cathedral churchyard every weekday until mid-September, so drop by and pay them a visit! A handful of the bosses in various stages of progress. Though the Victorian bosses are being used as a model, each piece is unique.